Stephanie Kelton posted couple of tweets that ignited a firestorm. While I seldom comment on Twitter, for lack of time rather than interest, I responded since I think that MMT economists must address the causes of inequality, not only economic but also social and political, because they intersect. The discussion continued on FB, where I added the following comment. Think extraction of economic rent as unearned gains, e.g., financial rent, monopoly and monopsony rent, land rent and natural resource rent. Rent extraction began with expropriation of the commons and slavery in ancient times and has been refined since then, although both are still operative. Socialization of negative externalities is also a from of rent, as is crime, of which corruption is no small instance. In a so-called capitalist society, wealth generates political power and policy and regulation that benefit special interests through regulatory capture and even state capture are also a form of economic rent. Under pure capitalism, an unattainable ideal, there would be no rent extraction since all gain in addition to that which is needed to bring goods to the market would be competed away. If this is not happening, see why. The right wing solution is to try to achieve the idealistic world of pure capitalism, which means decentralization and small business and farms. Not gonna happen. The left wing solution is to preempt the causes of economic rent extraction as far as possible and tax away the rest. Neoclassical economists know this but don't talk about it. It needs to be put on the table. Good on Stephanie for doing it. Economic rent leads to wealth concentration, and wealth concentration leads politically to oligarchy and plutonomy. Eventually this breeds social dysfunction and in hard times social unrest and revolt. The fortunes of a few are based on the poverty of many. Those in power (the oligarchs) will not relinquish control - it will have to be forcibly taken from them, at great cost to society. It's superb we're talking about this now. Not taking power from them also extracts a great cost to society, and perhaps the entire planet. I don't know. It seems to me upon death is the time for people to part with their claims on real wealth. -- Things like property, patents, copyright, commodities, companies/stocks must be sold outside home or some basic items passed on. Financial claims like bonds or bank accounts that society automatically inflates away with monetary policy, I don't see harm in passing on given inheritance taxes and the inflaion. Trust and Charity Loopholes should be eliminated. Kelton uses the progressive "Locker room banter" excuse for her hate speech. And VERY well said tom. The macroeconomic Profit Law reads Q=Yd+(I−S)+(G−T)+(X−M) and this boils down to Q=(G−T) and this says that Public Deficit = Private Profit. As a rule of thumb, the financial wealth of the Oligarchy grows in lockstep with the public debt. In other words, fabulous wealth is the counterpart of fabulous public debt ($21.5 trillion). Never in history was the debt so fabulous as in the present-day USA. It is a very old and still unproven assertion that competition drives profit towards zero. This, of course, shows only that the philosopher Tom Hickey has no idea what profit is. Overall profit does NOT AT ALL depend on competition but alone on deficit spending of the household and the government sector. Macroeconomic profit does NOT vanish with competition. 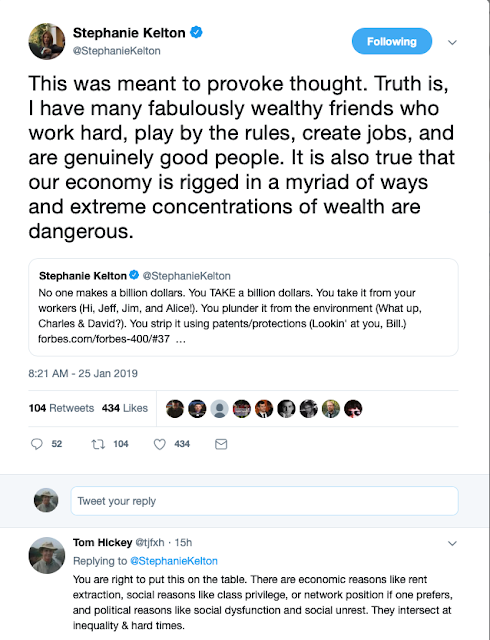 No group of political economists pushes “fabulous wealth” more than Stephanie Kelton and the MMTers. #4 Economists: scientists or political clowns?